Ask fellow campers about "Airstream Factory Terraport" and nearby attractions. You do not have to own an Airstream to stay here. Their Terraport has full hook-ups for $10. You can't beat the price. Limited shade. Yes most of the people staying here are there for service but that is not required. Super nice hosts/guides. Highly recommend the fun tour. Those with trailers and trucks had to take trailer off truck and park truck next to trailer. We camped at Airstream Factory Terraport in a Motorhome. Take the Airstream factory tour. Free spot since we had an Airstream appointment. Spots are level and short. Most have to unhook. They come by and pick up your unit via fork lift. The waiting room is very pleasant. One can also stay here for $10 a night. Not much to do here, but makes a good overnight spot 12 miles or so east of I 75. We camped at Airstream Factory Terraport in a Travel Trailer. We planned to camp here before dropping the trailer for service the next day. When we got there it was evident that our sewer hose would not be long enough and we wanted to rinse the black tank before dropping it. There is a dump station nearby if it doesn't matter to you. We camped at Airstream Factory Terraport in a Travel Trailer. Free for customers with an appointment for service or $10/night with W/E/S for short term visitors. No reservations, usually doesn't fill up each night. Pay for site at reception desk when office is open. Terraport was built to accommodate Airstream travel trailers but average motorhomes will fit. There is no brand restriction here. Back-in sites are arranged in a circle like spokes of a wheel with the hookups at the rear in the hub. Extension hoses may be needed. If stinky slinky won't reach, there is a dump station on the left as you leave the Terraport. Mostly level, Airstream asks that you place blocks under jack post and stabilizers to protect the asphalt, usually there are a few blocks laying around. There are no facilities other than what you bring. Obtain Wi-Fi password from reception desk. OTA TV works good. AT&T and Verizon almost work, was told Sprint is ok. Small bar/cafe in next block, another restaurant about 7 miles west near the exit off I-75. There are a couple of gas stations and a grocery store in town within a few blocks. This is a small rural town in an agricultural area, if the wind is wrong an occasional whiff of a farm may be noticed. There was an uneven spot on the road through town in the construction zone that caused lightly loaded 18-wheelers to "boom" as they crossed it. It maybe paved over now and wasn't particularly noticeable inside with the A/C fan running. Otherwise, this is a very quiet place to spend a night or 2. We camped at Airstream Factory Terraport in a Travel Trailer. There is a free 90+ minute tour of the trailer production floor every weekday at 2PM starting at the reception area that entails about a mile of walking at a slow pace and appears wheelchair accessible. Includes optional tour of the Airstream Interstate (Class-B) upfitting area across the street from the factory. No open toe shoes or sandals. Ear plugs and safety glasses are provided if needed. There is no sales showroom at the factory. Clean very level back in sites set up for trailers and not MHs. May have to disconnect if over 22 ft. plus truck No amenities but a good basic stop over with H2O, elect, and sewer. Anyone can stop for a nite for the tour. NO LONG TERM PARKING. Now the big problem! THERE IS NO CELL PHONE SERVICE HERE! Period! No cell phone company works. Airstream does have an internet that they will give you the passwords. We payed the $10 as we just wanted to see the tour and stay the night but when we found out the phone problem we had to leave ( I had a late night phone conference that night) The tour is very interesting and maybe a must see if you are anyway interested in Airstreams. We camped at Airstream Factory Terraport in a Travel Trailer. Just be aware there is no phone service here from any carrier. The Airstream Terraport is where you can camp while having service done on your Airstream at the factory. The Terraport is also available for camping if you are passing through, or taking the factory tour. It's nothing fancy, 30/50 Amp, water, sewer and Wi-Fi. No restroom or showers. They also fill propane tanks. And it's only $10 a night if you are not having service done. We camped at Airstream Factory Terraport in a Travel Trailer. The factory tour is daily at 2pm. They have a store which sells Airstream items as well as camping supplies. They also fill propane tanks. 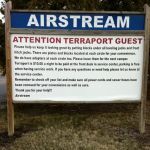 Are you affiliated with Airstream Factory Terraport ?